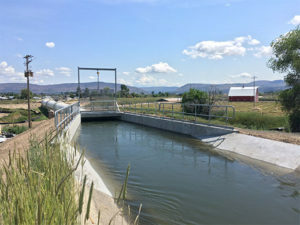 Adkins has been providing irrigation engineering services in Southern Oregon for over 30 years and as such we are familiar with the difficulties and complexities that farm/ranchers and irrigation districts may face when implementing new projects or improvements. 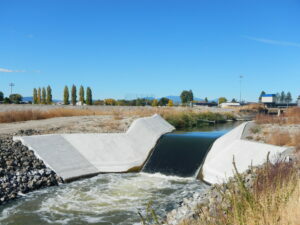 The C-G Drop is a reinforced concrete structure that allows Klamath Irrigation District (KID) to meter up to 700cfs of irrigation water delivered to thousands of acres of cropland in the district. In June of 2017, KID discovered extensive cracking and collapsing of the structure due to erosion underneath it. The District called Adkins to assist them with implementing emergency repairs to prevent the structure from failing. KID was able to complete the 2017 irrigation season with normal water deliveries. Unfortunately, further inspections of the structure made it clear to KID and the Bureau of Reclamation (USBR) that the structure needed to be replaced. KID hired Adkins to provide survey, design, project management, construction administration/inspection, and materials testing services for the project. In November of 2017, Adkins began design phase and by February 2018; the project was construction ready. During that time, Adkins worked with USBR for design reviews to ensure that the project met current USBR standards and requirements. KID was able to hire a contractor and complete the project without postponing the start of the 2018 irrigation season. The Klamath Basin struggles with limited water supplies and increasing demands for water, leading to conflicts between the Upper and Lower Klamath Basins during drought and water shortages. Adkins mapped and verified parcel size of irrigated land as well as other pertinent features that would help with water rights adjudication in the future. The purpose of a water right adjudication is to collect, catalog, and confirm all water rights through the court, and to determine to which property those water rights belong, binding property owners and all parties to the court’s declaration of those water rights.